Nancy A. Stemper, 73, of Morning Glory Drive, Hartford, formerly of Port Washington died Wednesday, May 28, 2008 at Aurora Medical Center, Hartford after a year long battle with cancer. She was born on March 1, 1935 in Port Washington to Charles and Elsie Marx Retzer. She graduated from Port Washington High School. She received a degree in education from the University of Wisconsin-Oshkosh. For two years she taught at Marion High School in Marion, Wisconsin. On July 9, 1960 she married Noel J., Stemper of Fredonia at St. Mary’s Catholic Church in Port Washington. They made their home in Port Washington while she taught Senior English for almost twenty years at Random Lake High School. She retired in the late 1970’s. She later worked in the office of Freeman Chemical Corp. in Port Washington until 1993. After many years in Port Washington they moved to Hartford in 2004. 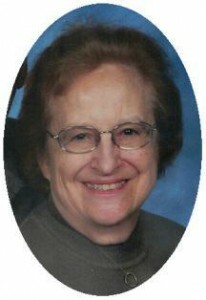 She loved her family and enjoyed reading and crossword puzzles. She is survived by her husband Noel, two daughters Mary Stemper of Brookfield and Carol (Darren) Zastrow of Milwaukee, three granddaughters Joan, Jessica and Jennifer Zastrow, sister-in-law Esther Retzer of Port Washington, brother-in-law Carl (Marion) Stemper of Tomahawk, nephews, other relatives and friends. She is preceded in death by an infant son and her brother James Retzer. A Mass of Christian Burial will be celebrated at 7 pm Monday, June 2, 2008 at St. Peter Catholic Church, 200 E. Washington Street (Hwy 175) Slinger. The Reverend Rick Stoffel will be the celebrant. Entombment will take place in St. Mary’s Cemetery in Port Washington. Family will receive friends Monday from 5 – 7 pm AT CHURCH. Memorials are appreciated.